Welcome to Josh Ayers, our new GleanSLO Program Coordinator! GleanSLO has grown and changed over the years and we are happy to welcome each new volunteer, farmer, neighborhood donor, community member and partner! We are also grateful for the individuals who have become our dedicated and hardworking staff. As we transition and say goodbye to Jeanine Lacore, our enthusiastic coordinator over the past three years, we also welcome her replacement, Josh Ayers. Jeanine and Susan have gleaned and trained with Josh over the past month and have seamlessly transitioned to keep our gleans running smoothly during our busy season of stone fruit and large farm gleans that occur each week! There are a lot of logistics that go on behind the scenes to pull off each and every farm glean, farmers’ market and neighborhood glean, and in addition there are numerous meetings, with visioning, networking, and brainstorming that happens with our Steering Committee, the Food Bank staff, community partners, statewide gleaning organizations and beyond. We have always found the right people to help continue the vision that we had when we first created our gleaning initiative for our county. 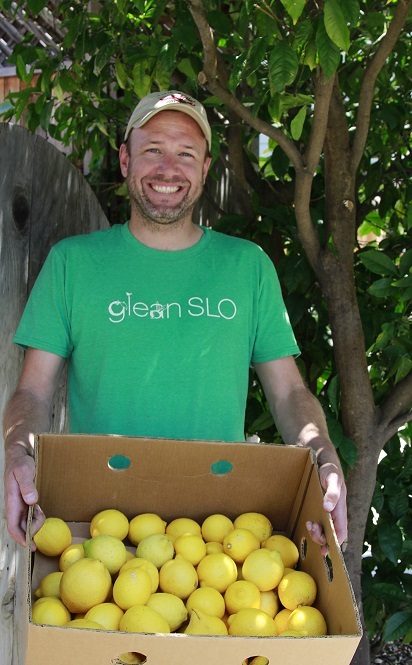 It is our hope that those of you that haven’t yet met Josh will introduce yourselves, share a bit about your experience with GleanSLO, and welcome him enthusiastically as we are. – Welcome Josh! We are so excited to get to know you, and have the GleanSLO community find out about you and your background. Please tell us about yourself. I grew up in Bakersfield and would frequently visit my grandparents in the small town of Shafter, which was about 30 minutes north. I used to love the drive to and from their house because I got to watch the cycles of all the crops being grown and harvested. In 2006 I transferred to Cal Poly from Bakersfield College and graduated in 2009 with a B.S. in Journalism. After graduating I accepted a job at a Santa Barbara-based software company. I lived in Santa Barbara for a year, before moving to Arroyo Grande, where my wife, daughter and I have planted indefinitely. I had held three different job titles at that company, the last being a senior editor for one of its own industry-related magazines, but quit at the end of last year to explore career and volunteer opportunities in the non-profit sector. I have been an avid gardener and plant propagator (or sometimes a plant killer) since my early childhood and credit my parents and grandparents for giving me those gardening opportunities to learn to like vegetables (cherry tomatoes and French breakfast radishes are still regulars in my garden). If I’m not gleaning or gardening, I’m probably in the kitchen planning or prepping the next meal for my wife and daughter. I love to cook, especially with homegrown or fresh produce. Outside of the home, I enjoy swimming, hiking, and fishing. — When and how did you hear about GleanSLO? Josh volunteering at his very first glean with GleanSLO. Photo courtesy Josh Ayers. I heard about GleanSLO in the fall of 2013 through the organization’s online listing for a program manager. At that time, I hadn’t had much experience in the non-profit sector, but decided to throw my resume into the arena to see what would happen. I was surprised by a quick call back, but I didn’t get the job at that time. Going through multiple interviews, including one with the GleanSLO steering committee was a great introduction to the GleanSLO program. After those interviews, I started noticing GleanSLO events and logos around the county and continued to follow the program’s growth until I was in a position to dedicate some of my time to gleaning. My first volunteer glean was arugula at Talley Farms. I was so excited after that first glean that I went straight to Farm Supply and bought my own harvest knife. To this day, I’m still hooked on being out in the fields or climbing trees to get that last piece of fruit, but mostly, I enjoy being around the multitudes of volunteers that come out and share their time, stories, recipes and smiles. –Do you have any ideas about the future of GleanSLO and the vision for a healthy community? How can we improve our work and our reach? Having said that, I believe there is still a large network of resources and partnerships that we haven’t tapped into that could help our program grow and help to build a healthier community. 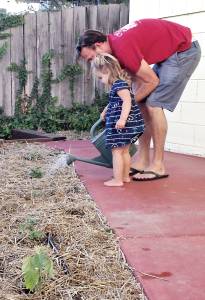 Josh gardening at home with his daughter. Photo courtesy Josh Ayers. I would love to see our program grow in a way that allows us to get at-risk youth involved in fun and meaningful community service, or at the least, provide them an opportunity to garner information about food systems, food waste and the abundant agricultural jobscape that we have in our county. I would also like to see elected officials in SLO County embrace California Assembly Bill 551, which allows for counties or counties and cities to establish urban agriculture incentive zones, or in other words, areas where individual properties (think parking lots or vacant investor properties) that can be zoned as “urban agriculture preserves” where small-scale farming can take place. Not only could this potentially expand our gleaning opportunities, but it could also allow for greater community involvement in the local food production network, as well as increase farming opportunities for potential growers who otherwise would not have access to large sections of land. 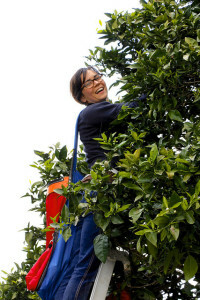 These zones have already been created in other parts of the state and if they were to be created here, I would love to eventually see a volunteer-run GleanSLO urban farm or garden that we could harvest from. –Do you have any favorite recipes to share, or how you like to eat/prepare your veggies? We love to find out about healthy tips and ideas to share with our GleanSLO community. I have too many favorite recipes to list! Most of those recipes hinge on memories of eating them with close friends or family (or both), and each one of them tend to mark certain eras of my life of when I first tried or was shown a way to prepare a fruit or vegetable that I had not liked up to that point in time. As for how I like to eat my veggies—I prefer to use my mouth. Seriously though, how I eat them depends on the type of vegetable and who might be eating them with me. Ten years ago kale was just a garnish to me. Then about five years ago, my wife, Kate, made a kale salad from a recipe that she got from her sister, where she massaged it with avocado, salt, freshly squeezed lemon juice and sesame oil and then added in strawberries, sunflower seeds and goat cheese. If Kate and I are eating kale, it’s pretty much certain that we will be having some variation of that salad. If it’s just me eating kale, I like to braise it Southern Style, in broth with apple cider vinegar, onions, and garlic. Resources for cooking are everywhere. I prefer word-of mouth recipes from friends, coworkers and family members and particularly recipes without strict instructions, as it allows some flexibility for experimentation and personalization. To this day, the only gleaned item that really gets me still is loquats. I first tried one from a local San Luis Obispo tree a few years ago. They are so delicious as-is, but I haven’t really had the opportunity to expand past that. If I do end up taking a stab at preparing a dish with them, I will probably go in the direction of preserves or jam, or try to use them as a sweet and tart component of a basting sauce for poultry or fish. I imagine they could be incorporated into salsa as well. 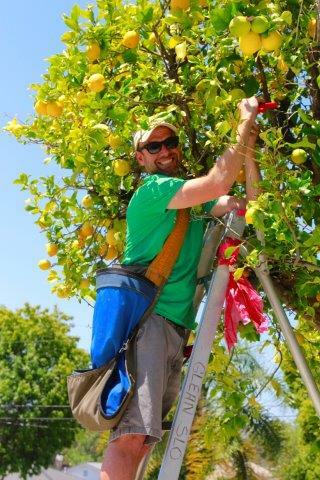 We hope you get a chance to meet Josh in person soon, at a glean or out and about around Arroyo Grande or San Luis Obispo. Josh is your go-to guy for registering your tree, scheduling a glean or signing up to volunteer. 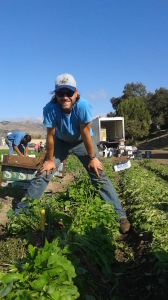 Josh can be reached at jayers@slofoodbank.org or 805-235-1180. This entry was posted in GleanSLO Interviews, Uncategorized on 06/26/2015 by gleanslo. Farewell Jeanine, thanks for being you! On June 19, we said goodbye and good luck to our dedicated Program Coordinator of three years, Jeanine Lacore. 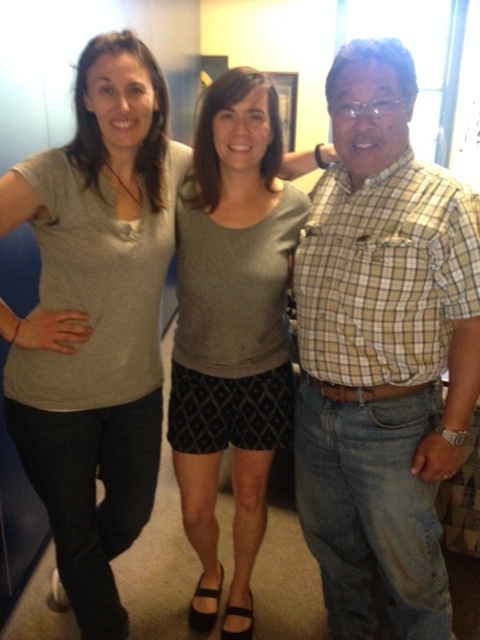 Jeanine has played a huge role in shaping GleanSLO into the successful (and highly organized) program it is today! Jeanine is setting off to travel across the country in her pickup truck and while we will miss her dearly, we couldn’t be more excited for her new adventures. We feel fortunate to have had the chance to work with her and be inspired by her passion for all things food and community. 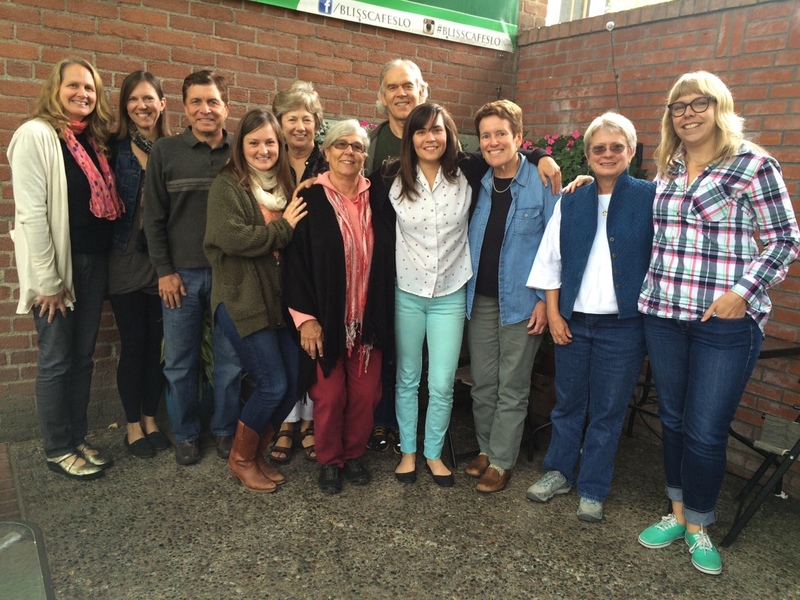 Before she hit the road, we asked Jeanine to reflect on her time with GleanSLO for our blog. After 3 years with GleanSLO I’m having a hard time summing up this experience without going off in a million directions. Where do I begin?! I suppose some of my earliest memories in life shaped my passion for food justice. My mom and dad raised a family of seven children on one working-class income. As a child I remember going to a church pantry and bringing home a couple bags of food that were quickly consumed by me and my siblings. I don’t ever remember being hunger, but I’m sure that my parents worried about how to feed us all. Now that I’m an adult I understand the issue of “hunger” and how it affects a large percentage of our population. I can sympathize with people going through the stress of having to choose between paying for a tank of gas or a decent meal. I’ve also come to realize that it’s not always about access to food, but more of an issue of access to healthy food. GleanSLO Steering Committee gathered to honor Jeanine before her last day. I never would have imagined I’d find such an ideal job. As the Program Coordinator of GleanSLO I’ve had the opportunity to explore so many beautiful nooks and crannies around San Luis Obispo County while tasting a rainbow of fruits and vegetables and have had the chance to glean next to some of the most inspiring, generous and thoughtful people in my life. One of my favorite memories includes picking apples in See Canyon during my first year as an AmeriCorps VIP member. I remember walking down rows and rows of trees so loaded the branches sagged toward the ground waiting for the weight to be relieved. With over 20 heirloom varieties of apples my taste buds marveled at nature’s bounty and to this day I will always be most fond of the Gold Rush variety! 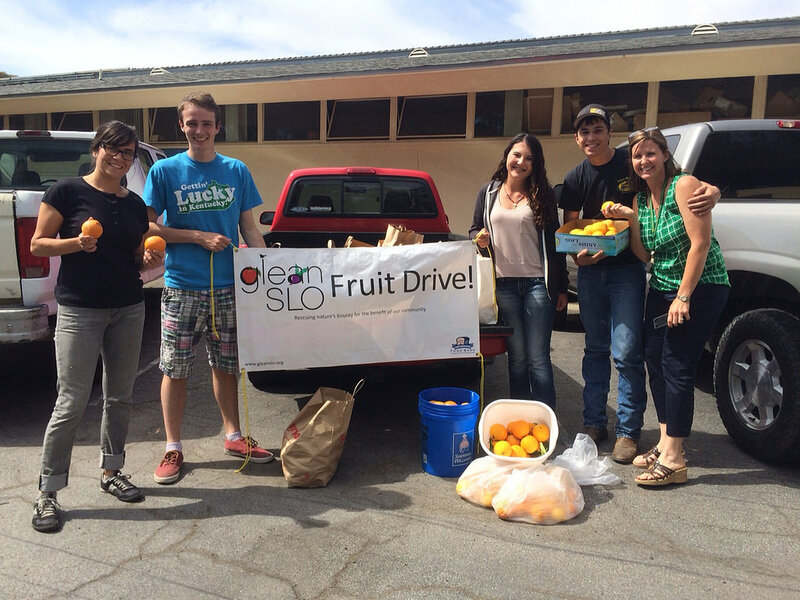 Jeanine was instrumental in developing GleanSLO’s School Fruit Drive program. This job (if you can even call it that!) has had the perfect combination of working outside, getting my hands dirty, using my detail-oriented tendencies, and having the chance to hear so many interesting stories from people who share my love for food and giving. At this point in life, I’m fortunate to be in a stable position surrounded by passionate people who also want to create a more just and caring world through the act of harvesting and sharing fresh fruits and vegetables. We all need to eat and food becomes the common denominator that divides the gaps between age, culture, gender, ethnic background, class, and so forth. There’s nothing more heart-warming than to see a group of volunteers out in a field or harvesting among the fruit trees rolling their sleeves up, sharing their recipes, and forming unexpected friendships that last far beyond a glean. In fact, I’ve found a handful of best friends and lifetime mentors along the way! I’m proud to have been part of the GleanSLO community and the SLO County Food Bank’s efforts to provide our neighbors in need with the nutritionally-dense food that everyone deserves. I believe I’ve experienced the true meaning of community—where there is a spirit of comradery and a desire to selflessly help one another through the simple act of sharing. Thanks to all who have been a part of this chapter in my life. These memories will resonate within me for decades to come, and no matter where I end up I will always be a gleaner at heart! Thank you Jeanine, we wish you all the best! This entry was posted in GleanSLO Interviews, Uncategorized on 06/24/2015 by gleanslo.